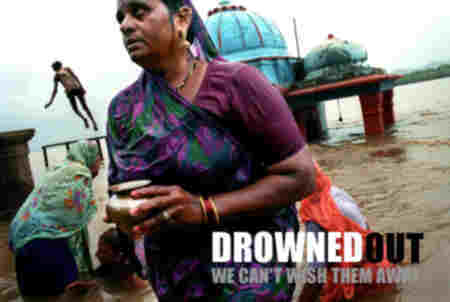 8000 families in India are in danger of losing their lives by drowning, caused by the building of the controversial Narmada Dam. A project executed by the Indian Government to provide 40 million people with water and electricity. Or so they say at least, but is it true? Franny Armstrong , an independent, no-nonsense filmmaker has made a documentary about this important issue called Drowned Out. Shot with a genuine eye for the beautiful Indian faces, landscape and, a to the point and focused narrative. Earlier she shook the world with her film Mc Libel, Two Worlds Collide, about fast-food giant McDonald suing two “innocent” London vegetarians for libel. First some facts: 85 % of rural households in India have no electricity, 250 million people have no access to water. The amount of people that live below the poverty line is more than the population of India was in 1947. Jaap Mees: Normally dams protect people from drowning, but here it threatens people’s lives. Franny Armstrong: “It’s not the first time that people will be submerged, but this is the first time that people say we will not move away from our land and will drown. You talk about dams built to stop flooding, but that’s not the main priority with the Narmada Dam. Anyway, it’s not really a film about dams, don’t you think? It’s more about how decisions made by people with power, affect people with no power. You got the idea for this film from a small article in a newspaper. Your last film Mc Libel, Two Worlds Collide, was also a big issue story. Are you always attracted by epic stories? I like stories with a human story at the centre, which deals with a important big issue as subject. The world is faced with so many crises, so I feel urged to make these films. I wouldn’t be interested in doing just a documentary on a multi-national corporation. I made non-epic smaller films before, like one on people affected by climate change and another one about racism in the British police force, but they are always about important issues facing the world. I wouldn’t waste my time on doing anything else really. Each epic takes two or three years, so I will only be able to make about 15 or so in my lifetime. You are more an activist filmmaker? No I hope not, I can’t stand activist films, I’ve never seen a good one! My films are definitely radical and coming from a well defined standpoint, but they are not your classic activist films. No,, particularly in the length of time they take to make. How much time did you spend with the people in your film before shooting? When we arrived the police were arresting the villagers, including us. That’s the first scene in the film, where people are standing with the water coming to their waist and then the police came in and drag everyone out.. Afterwards I spent a total of about 3 weeks with the tribal people, over about 5 months I spent in India. Did you have any connections in India? We had no connections at all. We went there three times. The first year was just me and my sister, who can use a camera. She smuggled the tapes out to Delhi and got our footage on the National News, which endeared the villagers to us. The first year, we stayed there for three weeks. The second year I went back with an Australian camera operator, I found via Shooting People, and stayed for three months and the third year I returned alone for six weeks. About 80% of the film I shot myself. Most of the best interviews were done in the last year - when I was on my own - because people really got to know and trust me. How did you find the family? Everyone I spoke to pointed to them, they lived near the river and their house is the first to be submerged. The main character, Luhariya Sonkariya, a young guy, is the village healer and priest. He lives there with his wife and three children. He picked up the shooting process really quickly and told others to speak normal and not to look at the camera. Someone pointed out to me the interesting fact that the film is partly about energy - as the Dam makes electricity - and the film was shot using solar power. There is no electricity, telephone, roads or postal service there, so we brought a tiny solar charger to power our video batteries..
What were the biggest obstacles to making the film? To get the visa. First we had tourist visa, the next year a journalist one. At a Conference in The Hague with the Dam engineers, I got invited to see the Narmada dam. It sounds silly, but the hardest thing was getting our interviews translated properly. There are seven different languages been spoken in the film, and with the tribal dialects in particular, very few people could speak them in combination with English. The building of the Narmada dam will provide water and electricity for 40 million people, according to the authorities. So it’s in the benefit of the far majority. That’s a moral question: can you sacrifice 250 000 people for the benefit of 40 million? 18 million people ended up in the slums, because of the building of earlier dams in India. And more important: who gets to decide? The people who build the dam and approve of it, would never like to be the victim of these decisions themselves. And what are they offering the 250 000 people who will lose their land, their culture, everything they have? At least you should offer them good housing. And then you have to ask: are those 40 million people really going to get the water? I think our film argues very clearly that they will never get the water, and that they are used as a smoke -screen for the real purpose of the Dam - to provide water to industry, agribusiness and three cities. And to make the politicians, engineers and construction companies feel great. Neru said : “Dams are the temples of modern India”. I think they are more like huge status symbols, often they irrigate only a small percentage of the land intended. Arundhati Roy, the writer of the novel The God of Small Things (a Booker Prize winner), wrote a damning indictment of big dams, called The Greater Common Good, which was burnt in public by supporters of the Narmada dam. She is one of the main interviewees in Drowning Out. All the broadcasters wanted to do is make a documentary about Arundhati Roy, with maybe a little bit on the Dam. There is a huge decrease in documentaries on serious International subjects, all across the TV channels. Channel 4 is doing a season called Indian Summer, you would think that this is ideal for them, but they are not interested. Nowadays it’s so hard to get a commission for any serious documentary, when there is not a famous face or celebrity attached to it. It’s so limiting and stupid!!! Going back to your film: what will happen with the people? The Monsoon rain season just started, when the rain comes they will be submerged and drown. So it is not just a threat, they will really die, it’s so extreme! Franny Armsrong’s next film will be a documentary for the cinema, she is inspired by Michael Moore’s Bowling for Columbine, on gun culture in the States. Shown in the main competition in the Cannes film festival this year and nationwide released in the cinemas across the US. Drowned Out will be shown at the Curzon Soho, London, on Wednesday, 28 August at 7pm.